For superintendents, it’s the stuff of nightmares. A morning tour of the course reveals the development of fairy ring, circular patches of discoloration on their otherwise healthy greens. To add insult to injury, mushrooms may be sprouting up in and around the affected areas. Aside from being unsightly, fairy ring can be damaging to the overall quality of turfgrass. While there are a number of fungicides on the market that have proven effective against this pesky disease, the fungal mycelia may create a hydrophobic situation that prevents water – and in turn the fungicide – from penetrating into the soil profile. Without proper penetration, the performance of fungicides may be seriously compromised. Because this hydrophobic tendency is so common with the development of fairy ring, most fungicides recommend the use of wetting agents on their labels. If you’re unfortunate enough to encounter fairy ring on your course this summer, your best bet is to pair a proven fungicide like Insignia, Heritage, or Prostar with a trusted soil surfactant like Revolution. 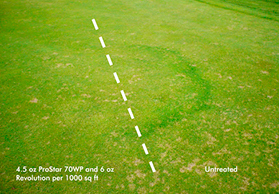 Research from Penn State University, the University of California, Clemson University, and the University of Florida has shown that Revolution can increase the efficiency of these fungicides and give superintendents the upper hand in the battle against fairy ring. Be sure to double-check the application rate for any fungicide before applying it to your course. The fungicide can then be mixed with Revolution at its labeled rate of 6 oz/1000 ft2 in 2 gallons of water (190 mL/100 m2). Depending on the severity of your problem, it may take multiple applications to completely eradicate fairy ring from your course. Remember to add Revolution to every fungicide application to ensure proper penetration and better rootzone distribution.